1957, Munich. Bernie Gunther's latest move in a string of varied careers sees him working for an insurance company. 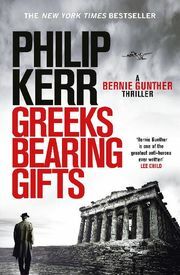 Sent to Athens to investigate a claim from a fellow German for a sunken ship, Bernie takes an instant dislike to the claimant. When he discovers the ship in question once belonged to a Greek Jew deported to Auschwitz, he is convinced the sinking was no accident but an act of vengeance. The 13th instalment in the Bernie Gunther series.